You’ve probably heard of the many senior dating scams that seem to be abundant online. It’s good to be aware of them, but don’t let them ruin your chance at happiness. Since many people are afraid of being scammed, especially online, many of them decide that online dating for seniors is just filled with scams and fraudulent members. This can’t be further from the truth. When you know what to look for concerning senior dating scams, you’ll be able to avoid them. Plus, by learning how to avoid and ignore scams, you’ll find your dating experience to be much more enjoyable. Online dating has gone mainstream, and as a senior dater, you are among 6% of people in your age bracket using online dating sites. 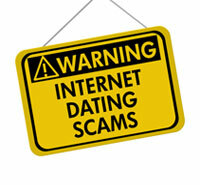 Online dating is safe, but occasionally an online dating scam can occur without you even knowing it. Do you know the best way to enjoy your online dating while being successful? It’s taking your time and going slow. When you read the tips section of our site, you’ll discover that online dating isn’t that much of a science. It’s more about going at your own pace and doing what you feel is right. Think about it. You’re going online to find other senior singles to date in real life. It’s OK to go slow so you can enjoy the experience. Plus, our tips will help you learn to recognize when to move onto the next person or take your potential partner out on a date.